Looking for that unique one of a kind special gift? Have you ever thought of giving a meteorite? 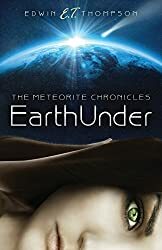 Come visit meteorites-for-sale.com, our online store where we make your shopping easy and secure. 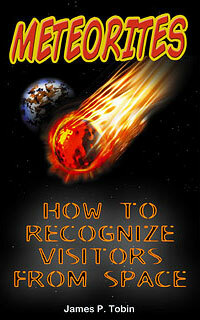 We’ve created a How To Buy A Meteorite Guide to help you select the right meteorite for your present. 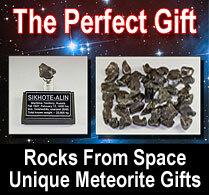 The perfect meteorite birthday or Christmas gift. This meteorite gift set features a 100% authentic Sikhote-Alin iron meteorite on a magnetic display stand, with a high quality aluminum display label. 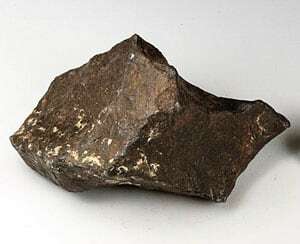 The price range starts at $29.95 to $79.95 depending upon the size of the Sikhote-Alin meteorite selected. 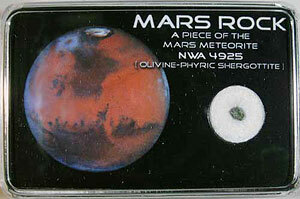 Who wouldn’t want to have a piece of the Moon or Mars? 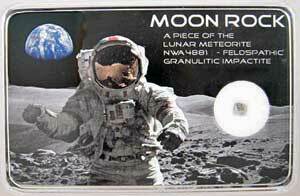 These meteorite gift boxes have been popular sellers for many years and we usually sell out at Christmas so grab yours while you can. Every wanted to give her the Moon? Now you can with our Lunar Meteorite Dust Pendants. 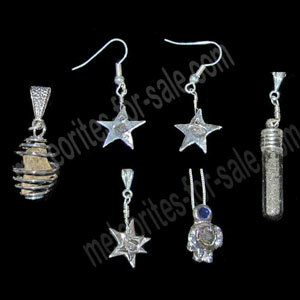 Also available are Mars Meteorite Pendants, Nantan Meteorite Pendants including our very popular Star and Heart Pendants. The Canyon Diablo Meteorite is famous for being the meteorite that created the impact crater we call Meteor Crater in Arizona. As a special offer when you purchase a Canyon Diablo Meteorite put “Free Meteor Crater Book” in the Comments section on the Checkout page and we’ll send you the book with your order. 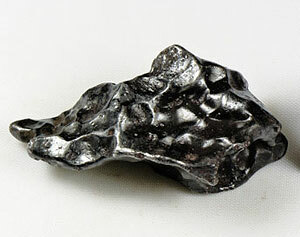 The Sikhote-Alin Meteorite fell February 12, 1947 in Siberia, Russia and was a huge meteoric event. These iron meteorite specimens make wonderful gifts with their unique shapes and character. We wish you all a Merry Christmas and Happy Holidays this holiday season!